Susme! San nakukuha ng mga kabtaan ang panahon para gawin ang mga bagay na ito?Susme! Kanino kaya ang skull cap at mitra at kasulya na nalapastangan? SUSME, KAWAWA ANG CULTURAL HERITAGE NG SIMBAHAN! Magpapatupad ng tighter security measures ang museyo. Tamang-tama, para pangalagaan ang mga bagong imahe. KORONASYON NG LILOK NA IMAHE NG LUMILOK. 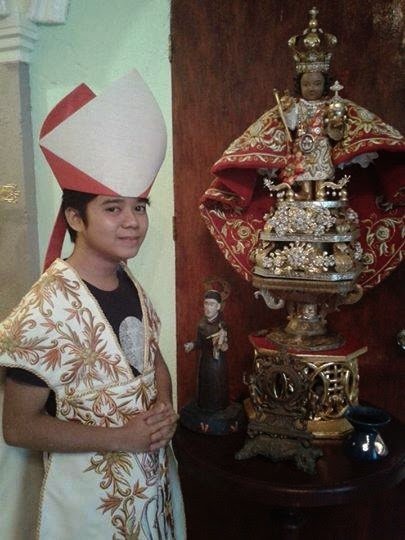 SANTO NINO NG - SANTO NINO DE - SANTO. EWAN. 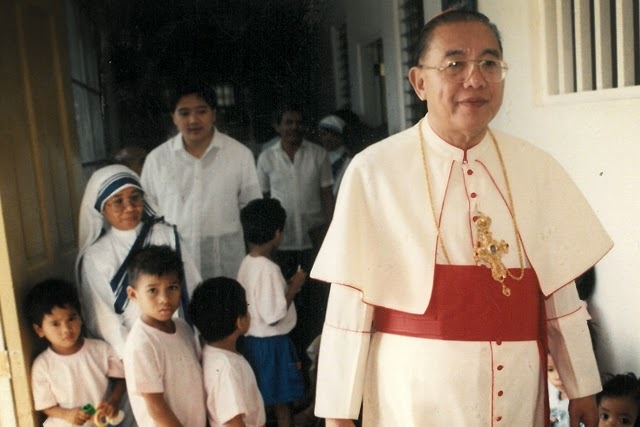 Happy 86th birthday to His Eminence Cardinal Jaime Lachica Sin. We need you but you are no longer with us. 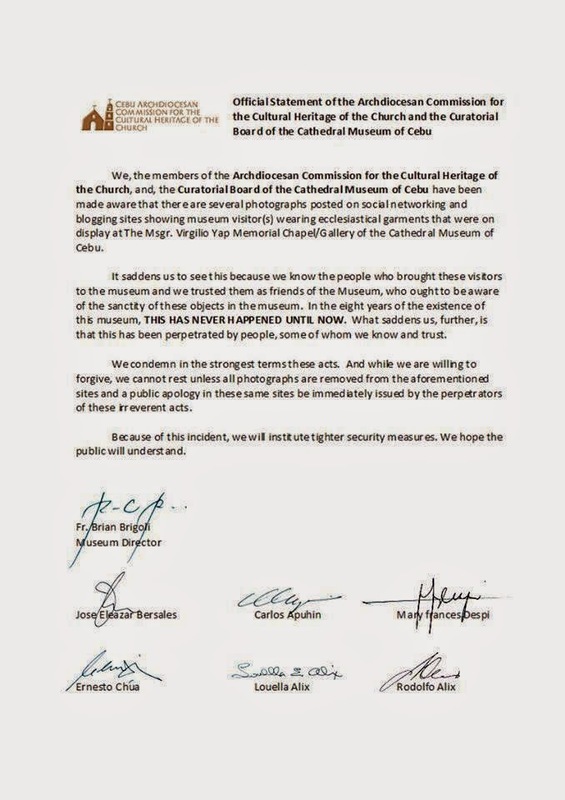 Read the OFFICIAL STATEMENT OF THE ARCHDIOCESAN COMMISSION FOR THE CULTURAL HERITAGE OF THE CHURCH and the CURATORIAL BOARD OF THE CATHEDRAL MUSEUM OF CEBU. Salamat Cebu sa maagap na pag kondena sa paglapastangan laban sa mga banal na bagay sa museyo. 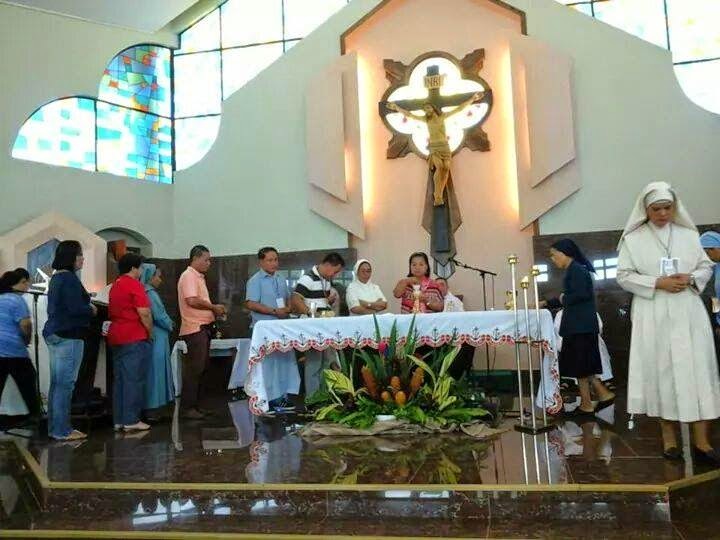 WHY CAN NOT METRO MANILA PARISHES DO THIS? IF CEBU CAN DO IT, WHY NOT YOU, YOU, AND YOU? Isang malaking GULP ang naganap sa Davao. 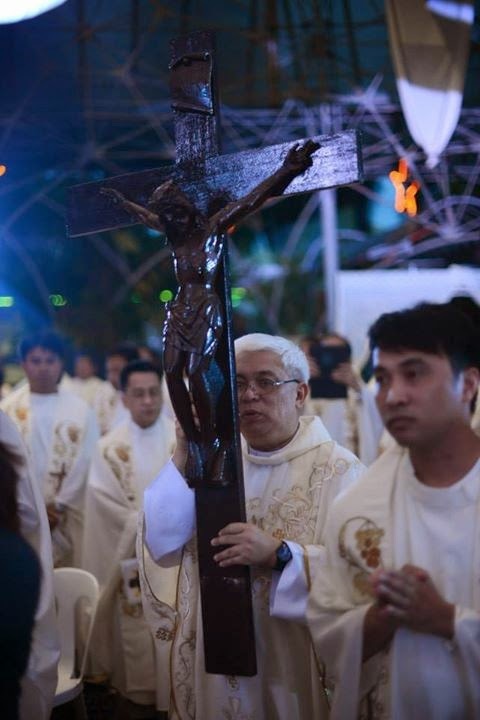 Susme, sa mismong Archdiocese pa ng tinuturing ng ilan na 'conservative' daw na Archbishop Romulo Valles. Can you guess what the GULP is? Ang pasimuno, following the footsteps of his master (small m), seen in the background. Salamat, Master Chiriko sa pictures! 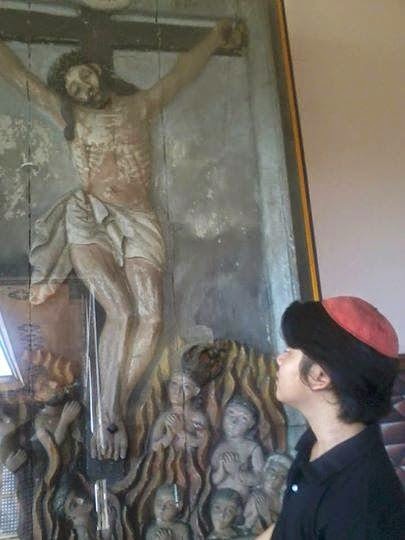 Even Church museums are not safe from the young, deluded Catholic CosPlayers. Nobody is safe. No where is safe. Aside from the sanctity of these items, the historicity is also placed in danger. For what? Sa ngalan ng CosPlay. Presenting the latest Axe Deodorant Commercial, care of De La Salle State State University (because they follow the line of the republic on Reproductive Health). Here we see the models raising their hands as if in an act of blessing, when there is already a priest blessing already the Lay Brother. HINDI KAYO PARI PARA MAG-BLESS. WAG MAG-FEELING. PERIOD. The liturgical liberals think that they are winning by making the Altar Cross in Papal Masses small and insignificant. But look! 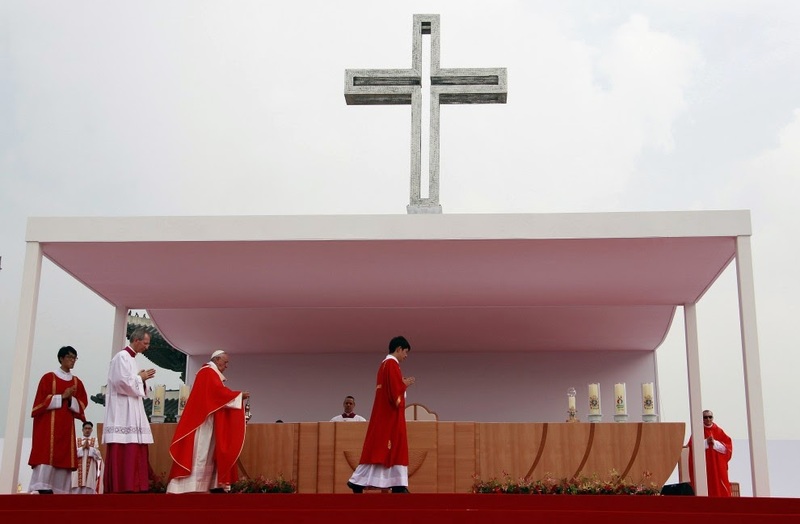 Pope Francis incenses not any other crucifix but the Altar Cross. 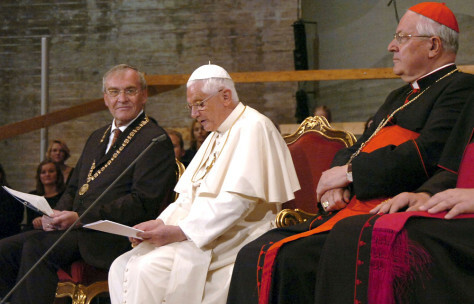 Pope Francis recognizes the theology of the 'Centrality of the Cross' of Pope Emeritus Benedict XVI. 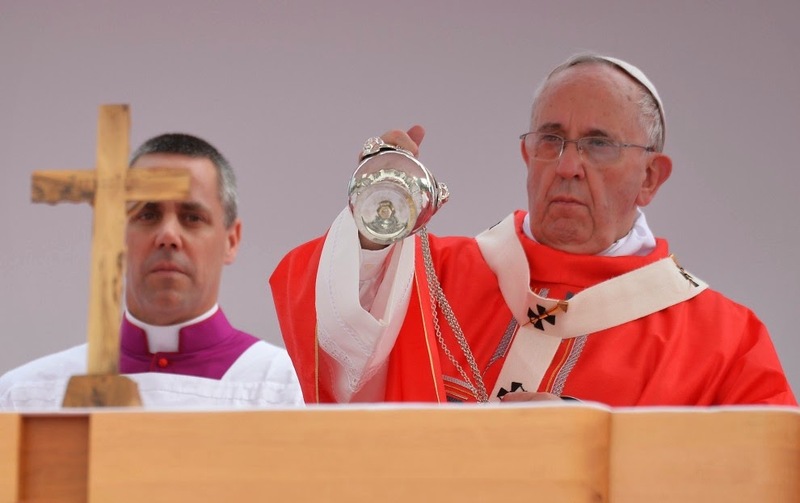 Do you think we will see a small or large altar cross in January 2015? Because name-calling Apologetics is not the way to do it! 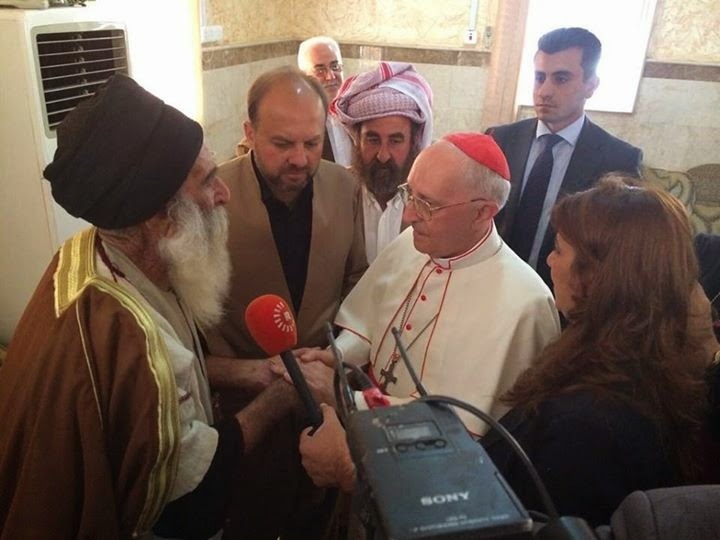 Papal envoy to Iraq meets displaced Christians and Yazidis. Former Apostolic Nuncio to the Philippines, Archbishop Ferdinando Cardinal Filoni, was the Pope's personal envoy in Iraq. 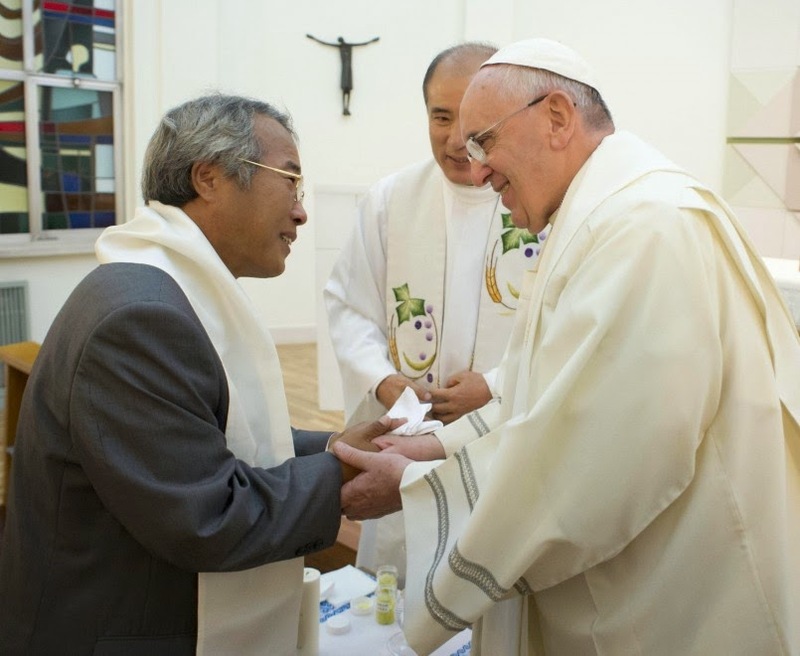 A TPC reader alerted me to a news report published in the Davao Catholic Herald. It was written by John Frances Fuentes, the same reporter who wrote for the CBCP News about the NMDDL and the Misa ng Bayang Pilipino. 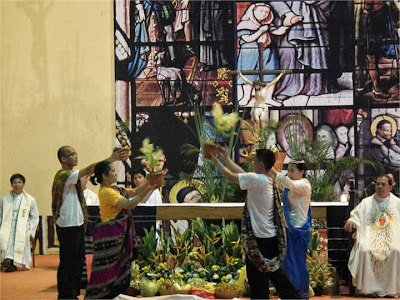 In his Herald article written in Cebuano, he discusses how the Misa ng Bayang Pilipino was presented and approved by the Sacred Congregation for Divine Worship and the Discipline of the Sacraments on August 10, 1976! A quick check on the Acta Apostolica Sedis renders NOTHING. No act from the Sacred Congregation about the MBP is there! You can view the AAS report for 1976 here. And if you look at the online copy of the missalette of the Misa ng Bayang Pilipino during the PCNE, you can see that Fr. Diwa ADMITTED that this rite did not get the approval of the Holy See. So, how do we make out of this? Maybe, the reporter was ill informed by priests who continue to spread lies about this illegal rite. Or probably, the reporter is into it also. What we know is that the Davao Catholic Herald published a wrong information. To advocates of religious dialogue with Islam......WAKE UP! 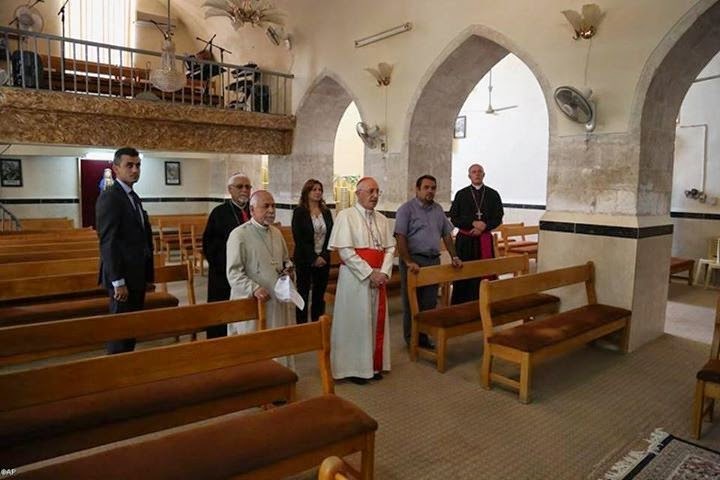 The Chaldean Catholic Church is an Eastern Rite church, under the authority of Pope Francis. 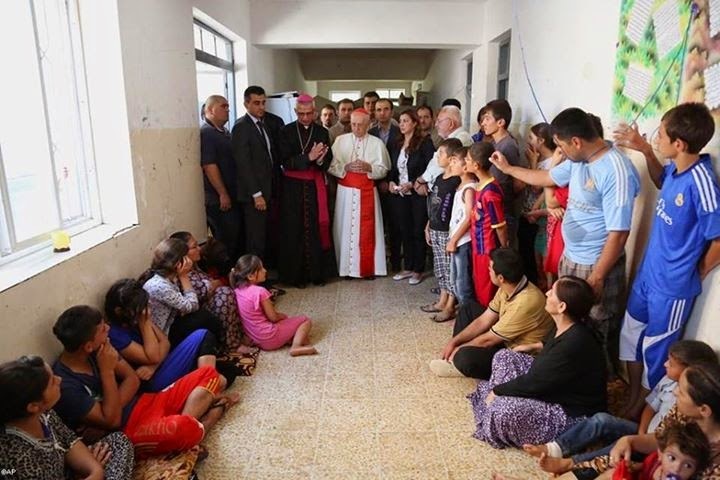 In an interview with Corriere della Sera, Archbishop Amel Nona, now living in exile in Erbil, in Kurdistan Iraq, commented on his diocese in Mosul being overrun by radical Islamists. Read the entire article here. Rorate Caeli first reported the quotes of the archbishop in exile. They will not stop until they dominate. There is no such thing as peaceful co-existence with them. Sunnis are killing Shiites and vice versa. 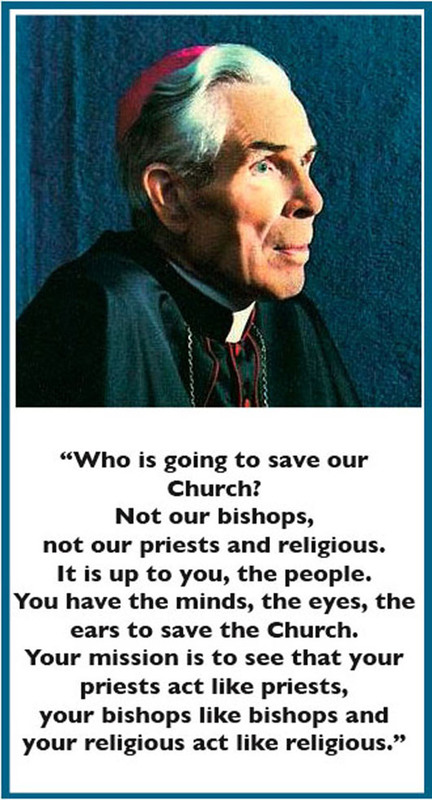 Vatican II said it and our chapels and churches do not have it at all. There is too much noise in our churches. Too much feel good music! No time to pray and reflect after the readings. No time to reflect and pray after the homily. No time to reflect and pray after Holy Communion . That is why people who crave for the sacred silence come to worship the Lord through the Traditional Latin Mass. Read here and here. And may this image stuck in your mind. He prayed not like how we pray today, raised arms, dancing. He retreated into the mountains for the silence. 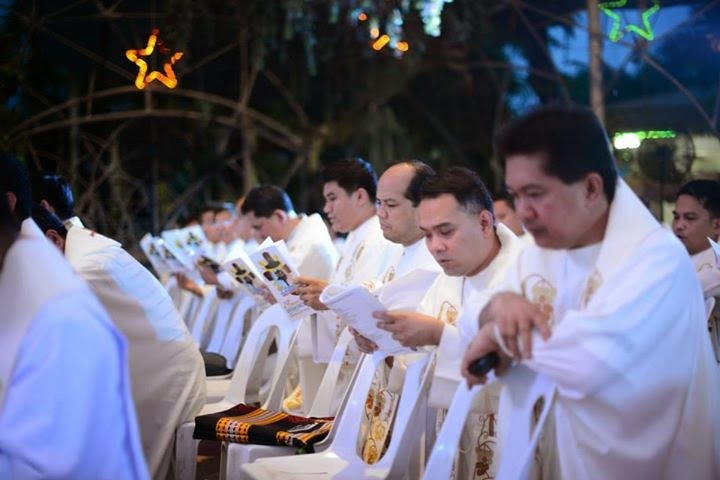 Carmelite Retreat house in Tagaytay openly promotes illegal rite! 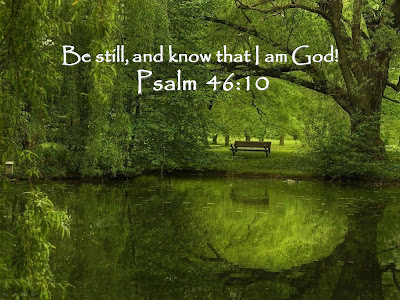 I was surprised to find this in the website or blog of the Carmelite Missionaries Center of Spirituality, Kabangaan Road, Iruhin West, Tagaytay City. 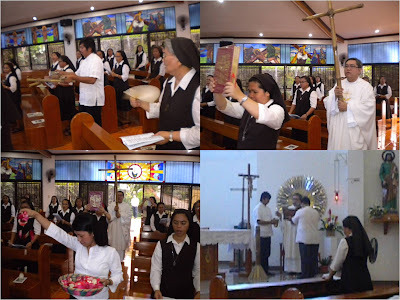 The sisters openly promote the illegal form of the Roman Rite. Current liturgical legislation for Latin Rite Catholics have only one rite, the Roman Rite, but two forms, the Ordinary Form (the Missal of Ven. Paul VI, with the addition of the name of St. Joseph to the four anaphoras (Eucharistic Prayers) by the reigning pontiff, Francis) and the Missal of St. John XXIII also known as the Extraordinary Form. Apart from the indult granted for the Diocese of Zaire or now known as the Zaire Use or Roman Missal for the Dioceses of Zaire, and the Anglican Use for the Anglican Ordinariate and other limited use rites, nowhere will you find a document giving the Misa ng Bayang Pilipino permission to be celebrated. 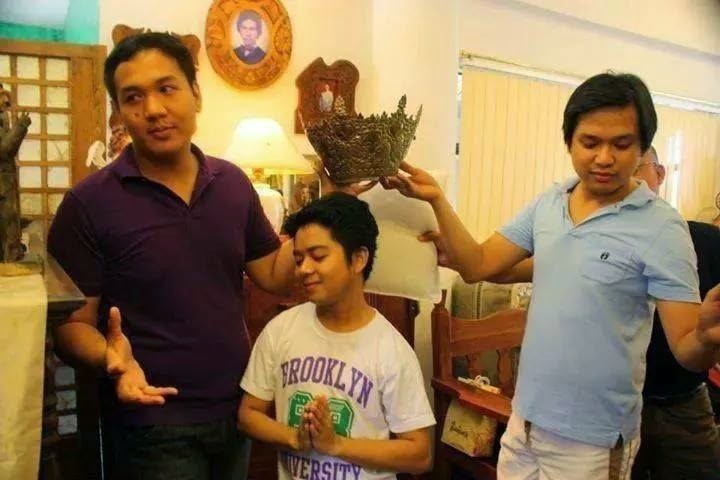 the Misa ng Bayang Pilipino is ILLEGAL! And anything done illegally, is IMMORAL. My doctors told me to have less Facebook. My account placed this in me. 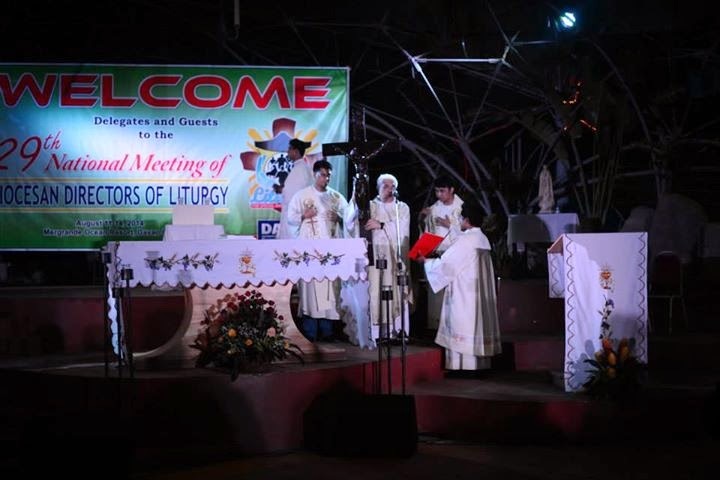 DAVAO City, August 13, 2014—The Archdiocese of Davao will be hosting the 29th National Meeting of Diocesan Directors of Liturgy (NMDDL) from August 11 to 14. 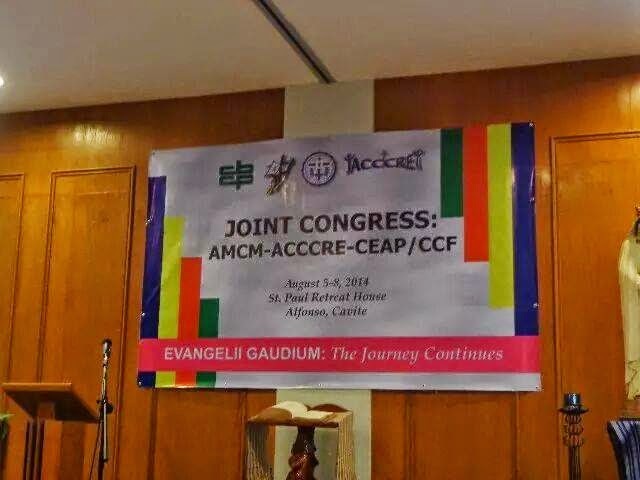 Aside from these, the conference will also tackle the proper catechesis on the approved New English Translation of the Rite of Marriage for the Philippines and the Rite of Confirmation. 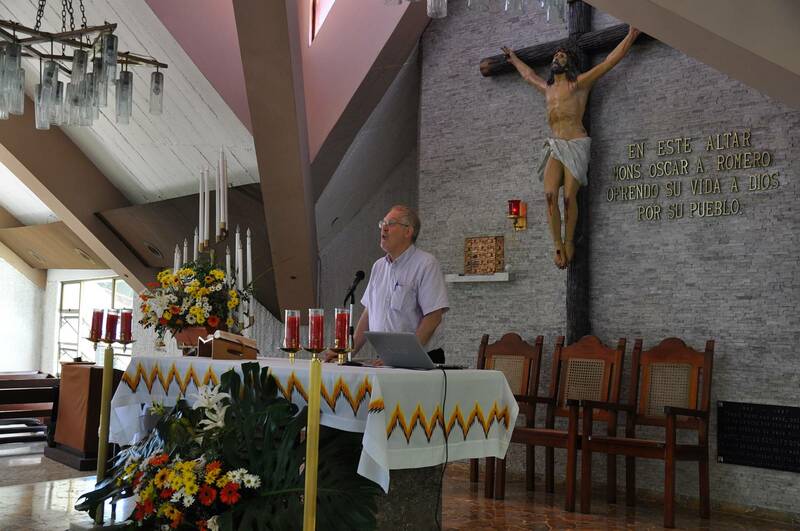 NMDDL is a yearly gathering of all directors of the diocesan liturgical commissions in the Philippines in order to update them on liturgical concerns, promote coordination with the Episcopal Commission on Liturgy, and to create closer ties among liturgical commissions. The first NMDDL was held in 1986 in Tagaytay City. A yearly event that does not even talk about the REALITY and LEGALITY called the Extraordinary Form of the Roman Rite aka Traditional Latin Mass. If you have shepherds who are uncharitable and suspecting you of being SSPX because of your attachment to the ancient form of worship that is UNIVERSALLY legal and binding as per the Motu Propio, Summorum Pontificum, I couldn't help but scratch my head, in disbelief how Catholic Masses with all the liturgical creativities and nonsense like dance, and Misa ng Bayang Pilipino could be allowed even if they are blatantly ILLEGAL in the eyes of the competent authorities of the Church. 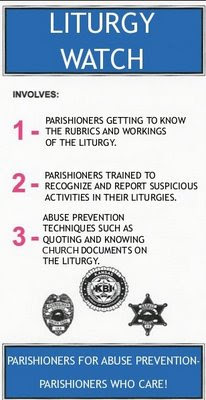 Diocesan Directors of Liturgy MUST always teach first and foremost adherence to the liturgical norms of the Church. These men and women wallow in their liturgical academic degrees as their license to do whatever they want with the Holy Mass EVEN IF Holy Mother Church forbids anyone from adding or subtracting anything from the approved texts and norms. 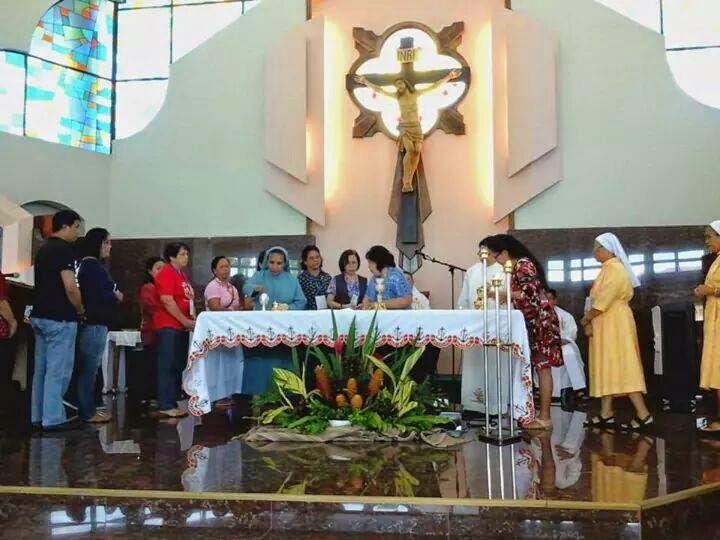 Where is Misa ng Bayang Pilipino in Sacrosantum Concilium? Where is that in ANY Vatican II document? 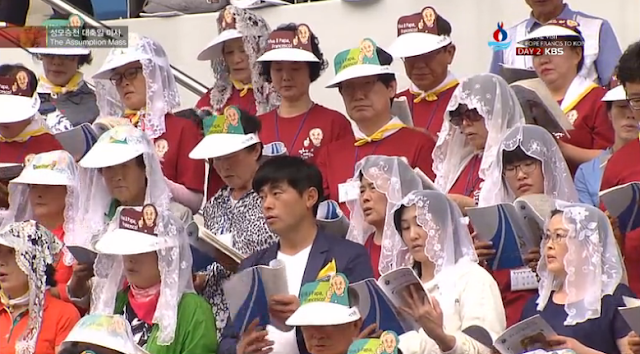 Is it just me or are South Korean Catholics know the importance of veils more than Pinoy Catholics? Should veils make a comeback in the Philippines? 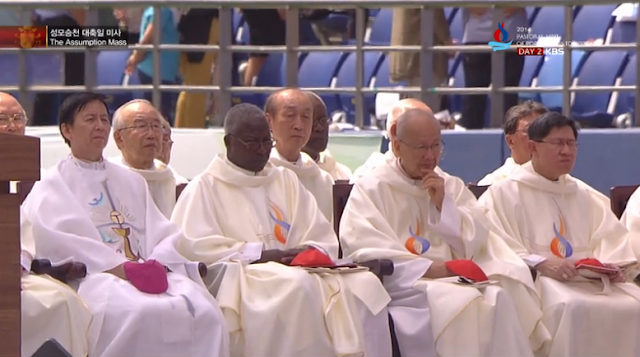 Look who was at South Korea to be with the Pope! 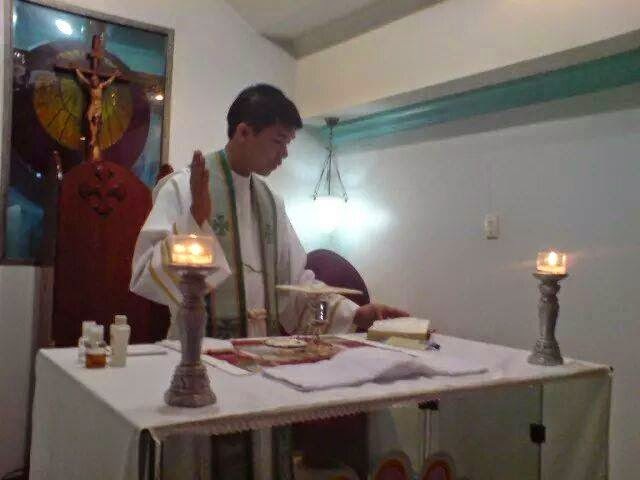 Manila Archbishop Luis Antonio Cardinal Tagle together with 50 plus more Asian bishop met the Holy Father for a meeting at the Haemi Martyrs Shrine on August 17, 2014 in Haemi, South Korea. 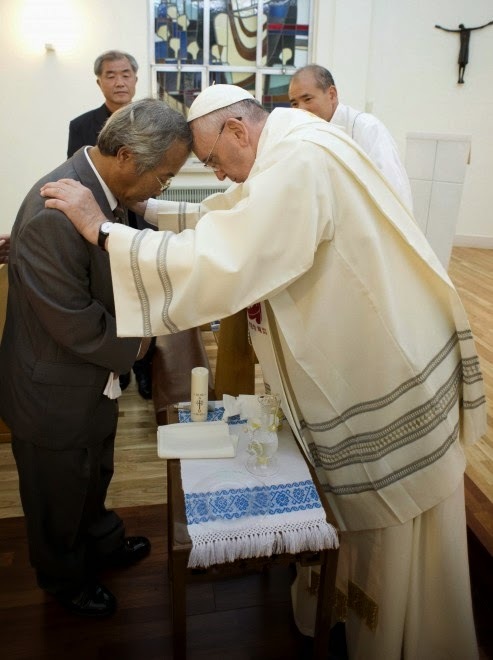 He later joined the Mass at the World Cup stadium. 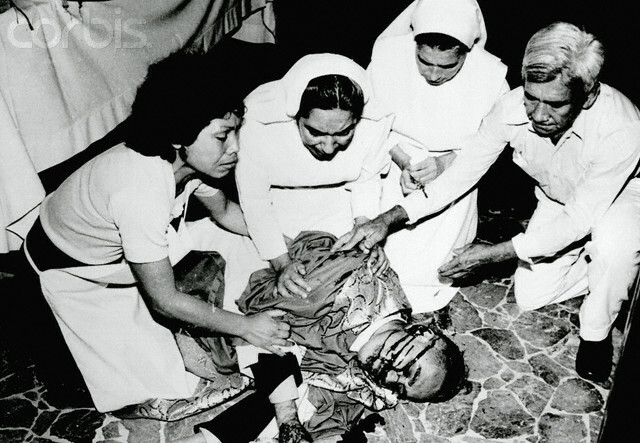 Archbishop Romero after he was shot. ABOARD THE PAPAL PLANE (AP) - Pope Francis opened the way Monday to a quick beatification for Oscar Romero, saying there are no more doctrinal problems blocking the process for the slain Salvadoran archbishop who is one of the heroes of the liberation theology movement in Latin America. The chapel where the archbishop was murdered. At the back it says "At this altar, Mons. Oscar Romero offered his life for God and his country." Archbishop Romero was a controversial figure indeed but his defense of the poor who are also like us, children of God cannot be underestimated. But the question whether he was martyred for his Faith, or for acting out the faith and doing his role as a shepherd has to be answered by the competent authorities. Not by a "Facebook theologian" who can't construct a decent English sentence. 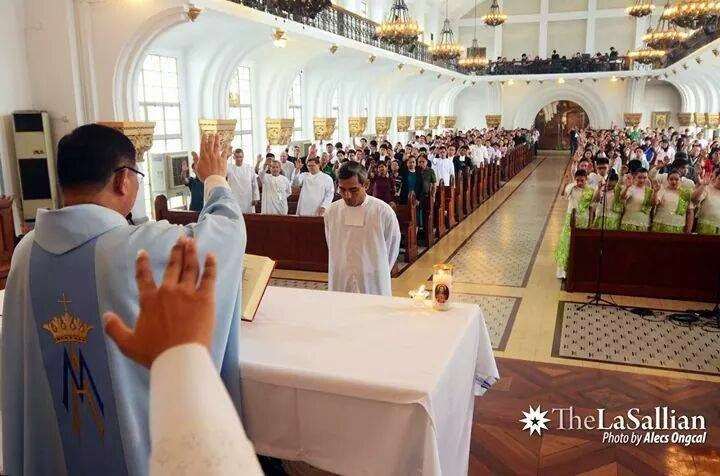 The late Archbishop Leonardo Legaspi was laid to rest yesterday. May God grant him eternal rest. 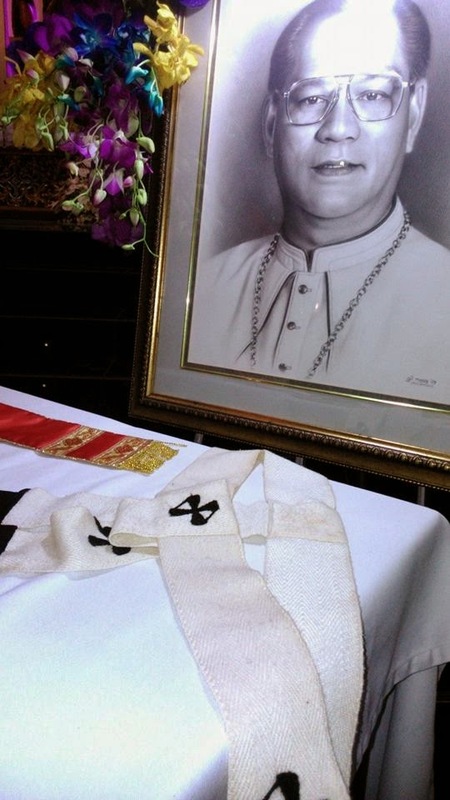 Sadly, those who oversaw his wake and funeral overlooked at an important and vital part of the rite and protocol befitting an Archbishop. What is it? Answers in the Comment Box! What do you expect from an event organized by the Church, for the Church? 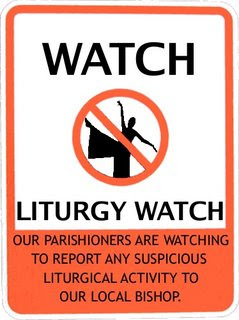 A good liturgy, right? Answer in the ComBox what grave liturgical abuse was committed in these pictures. Islam is a religion of dominance! It will use all possible means, violence of course, in order for it to spread. Cardinal George Pell was quoted as saying ""They showed the link for many Islamists between religion and violence, their refusal to respond to criticism with rational arguments, but only with demonstrations, threats and actual violence,"
It was born by the sword. Do not be surprised if dialogue for peace is possible in this religion. PS: The lecture is about the disdain for religion of the West. Just in case you didn't know. Meet Blessed Isidore Bakanja, a convert to Catholicism, back when missionaries work to preach the Gospel and bring people to the One True Faith. He was baptized at the age of 18. He worked for the white colonizers as an assistant mason. He never forgot the lessons taught him by the Trappist missionaries; a Christian must be recognized by the rosary and scapular (Mary's habit, as it was rendered in Isidore's native tongue). And this he kept all his life. He found employment in a Belgian company that controlled the rubber plantations in the region as a house boy. Many of the agents were Christian-hating atheists. The missionaries' defense of the natives' rights and their denouncing of injustices perpetrated against them earned the ire of these atheists. Isidore soon experienced this hatred. He was told to stop teaching his fellow workers how to pray: "You'll have the whole village praying and no one will want to work", one agent shouted at him. Isidore was also ordered to take away his scapular. When he did not, he was twice flogged. The second time, the agent tore the scapular from around Isidore's neck and threw him to the ground. He had two servant boys hold Isidore by his hands and feet and a third one flogged him. The whip was made of elephant hide with nails protruding at the end. Isidore asked for mercy. "My God, I'm dying". Isidore bore all the blows patiently. After the beatings, the bones on Isidore's back were exposed. After the scourging, his legs were chained, and he was thrown into into a hut for processing rubber. He was severely beaten he could barely move. When an inspector was about to visit the plant, Isidore was moved to another village. Unable to walk, he fell by the wayside and hid in the forest. When he heard the inspector, he dragged himself before the inspector. The inspector himself left a written account of his impression: "I saw a man come from the forest with his back torn apart by deep, festering, malodorous wounds, covered with filth, assaulted by flies. He leaned on two sticks in order to get near me -he wasn't walking; he was dragging himself". The agent, responsible for the beating, appeared on the scene and tried to kill "that animal". He was restrained by the inspector. He took Isidore to his own settlement, hoping to help him heal. But the beating was so severe, that the wounds have become infected. Isidore felt death nearing. 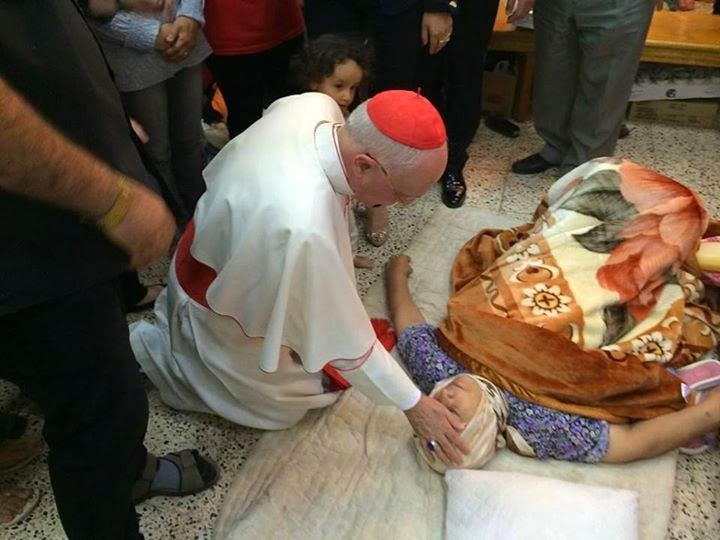 He told someone who had pity on him: "if you see my mother, or if you go to the judge, or if you meet the priest, tell them that I am dying because I am a Christian". Two missionaries spent several days with him and gave him the last sacraments. He told them the reason for his beating: "The white man did not like Christians.... He did not want me to wear the scapular.... He yelled at me when I said my prayers". The missionaries urged Isidore to forgive the agent. Isidore assured the missionaries that he had already forgiven them, that he nursed no hatred for him. The missionaries urged Isidore to pray for the agent. "Certainly I shall pray for him. When I am in heaven, I shall pray for him very much". His agony - more painful than the actual flogging - lasted six months. He died on either 8 or 15 august 1909, rosary in hand and the scapular of Our Lady of Mt Carmel around his neck. He was a convert for two and a half years but lived his life since his Baptism like he was a Christian all his life. His feastday is celebrated in his native country and in the Carmelite community every August 15. May we follow his example of boldly proclaiming the Faith. May the Christian martyrs of the Middle East bring about the fall of the Islamic State of Iraq and Syria and all jihadists and Muslim extremists. May the blood of the martyrs bring these people towards conversion. 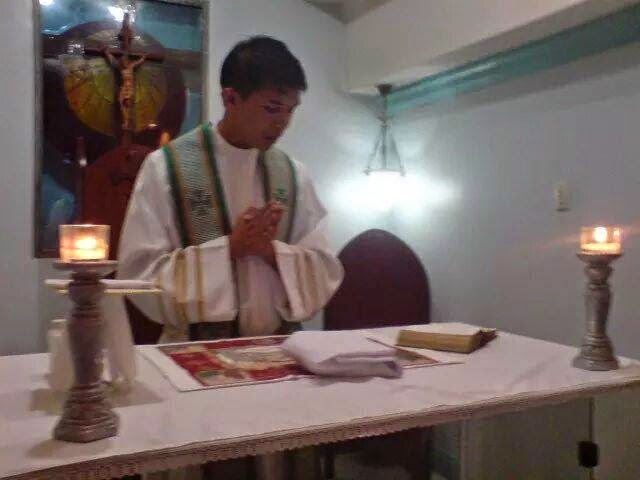 Nag misaMisahan nanaman si "Father" Mark Bunag sa Trece Martires. 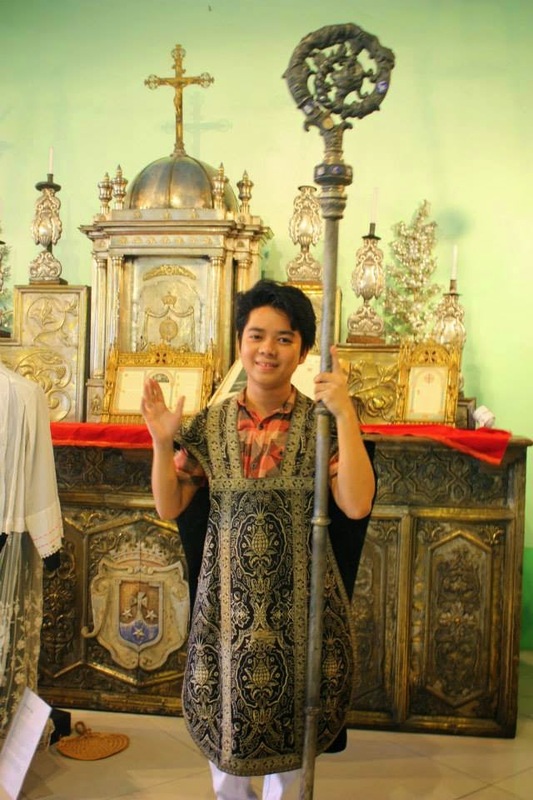 He introduces himself as a priest from the Archdiocese of Manila. Bakit kaya? Kasi alam niya na HINDI SIYA PARI. 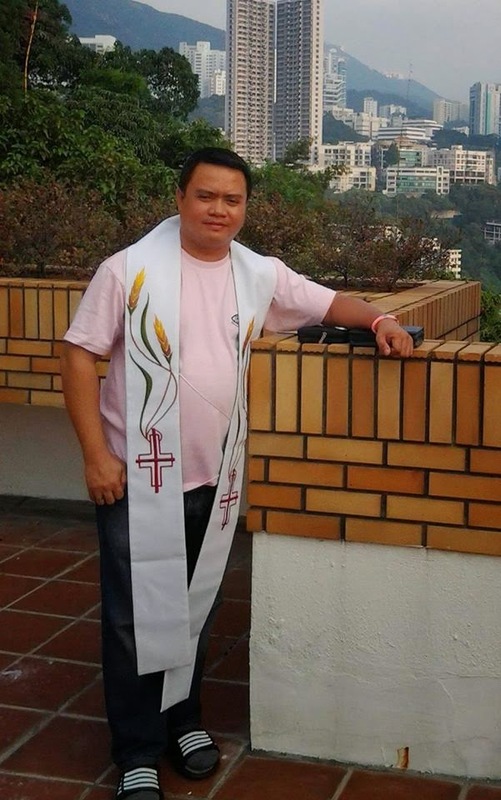 As early as 2011, the Roman Catholic Diocese of Pasig already released a statement WARNING the faithful about this bogus priest. Dressed "properly" for Holy Mass. Posing for a souvenir photo after Holy Mass. If he were a school director and he would prevent my grandkids from entering the school because they are not in proper uniform, oh boy, he would get it! 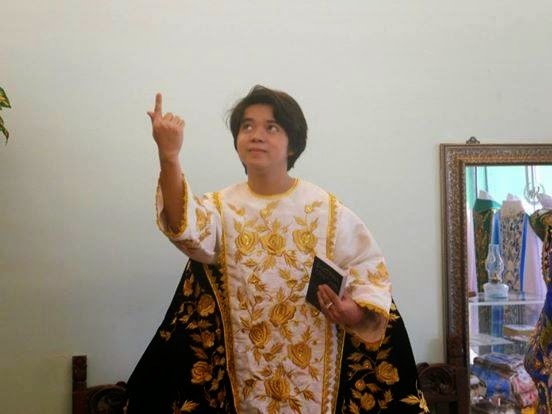 I still cannot find anywhere that the prescribed and official liturgical garb for celebrating and concelebrating priests are the stole and the street clothes. And not the stole and chasuble or chasu-alb. 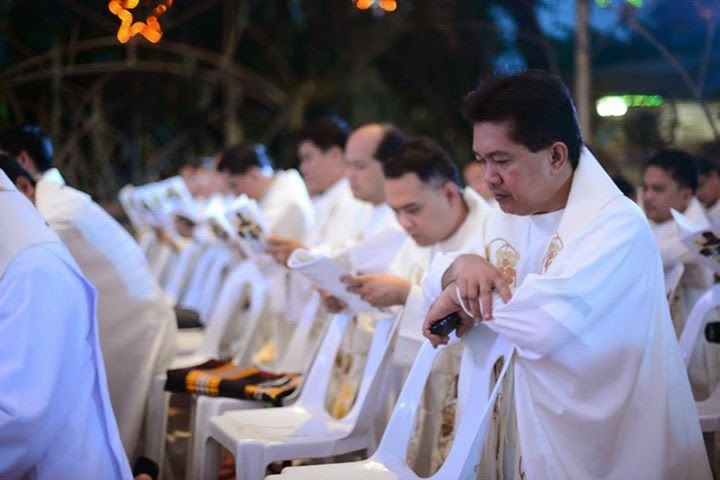 If you have priests acting this way in a holy event, in the MOST holy event for us Catholics, and this is the job, the ONLY job they are expected to perform their BEST, who needs priests when you can get wannabes who can perform better?